Inosanto’s backyard gym in 1973, before the opening of the Filipino Kali Academy in Torrance California. 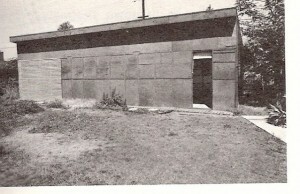 Many of Dan’s early student’s trained here. Ted Lucay Lucay, Chris Kent, Tackett and Poteet to name a few. This gym was in Dan’s backyard behind his house. It just goes to show that the school can be anywhere. The people in the arts are more important then the building with four walls. I’m sure the old crew have some great stories to tell that took place in this gym. 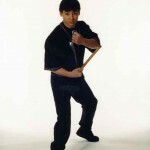 The Filipino Martial Arts have crossed many lines, movies, football, special law enforcement groups and the military. So by no surprise, why not the WWE. The individual bringing it to center ring, is none other than big Dave Batista. Batista is a body builder, actor, but best known for his time in the WWE. 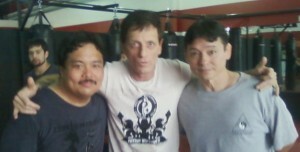 Dave is also a Filipino who has found an interest in Filipino Martial Arts and is working on fighting in the UFC. He currenty trains with Marrese Crump who is also a martial artist and actor. Dave is training different styles of martial arts for the octagon but seems to have a passion for FMA. All I can say is good luck to him in his UFC interested and it is great that he is training and promoting the Kali.